We are located in the heart of Guanajuato, with an unbeatable access to tourist points. 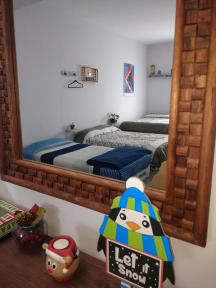 We are a small hostel, with relaxed and quiet atmosphere, we have 3 private rooms 2 and a mixed bedroom, 2 full bathrooms, terrace, TV room and open kitchen so you can prepare what you like in your stay, our motto feel at home is our best description. We are located in the center of Guanajuato, with an unbeatable access to tourist points, 50 meters from the main square, 200 meters from the Juarez Theater and 300 meters from the University of Guanajuato. To our surroundings you can find cafes, bars, restaurants, galleries and museums. We have different types of accommodation options that will suit diverse kind of guests and travellers. In this sense, we have private rooms for four people, perfect for friends and families travelling together, meanwhile we also have a mixed dorm for five people that is perfect venturesome travellers. The reception is not open 24 hours. Nevertheless, if you will arrive late, please let us know beforehand to receive you. This hostel is so cozy and welcoming, it felt like sharing an apartment with friends. The location is super central, the breakfast is great (the kitchen is pretty well stocked so you can make your own eggs, oatmeal, or more), the roof terrace is beautiful, the two dogs are super sweet, and the bathrooms feel like you are in a home not a hostel. There are only 2 bathrooms, but that wasn't a problem while I was there and the hostel was pretty full. I will definitely stay there again! 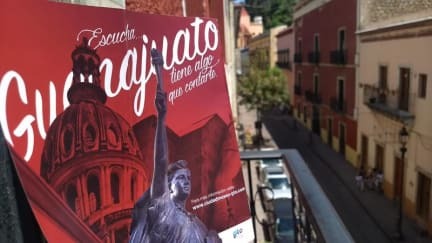 A fantastic hostel in the heart of the historic centre of Guanajuato. The host is very welcoming and the small size of the hostel makes for a cozy and friendly atmosphere. Excellent value for money and I would definitely stay here again! Great place to stay in Guanajuato. It is located at the heart of downtown. The place is clean and the beds are comfortable. They also have a nice rooftop. Excellent hostel with a homely vibe. Good facilites and unbeatable location. Would definitely stay here again. I loved my week stay here - it's much more like a home than a hostel and Gabi was the best best host. Not sleeping in a bunk bed was really nice and getting to make your own breakfast was cool too. It's in a central location and with it being a small hostel, it was really easy to meet people. Thoroughly recommend! I stayed three nights. The rooftop was perfect for beer, eating, and drinking. I stayed in a room with three beds. My bed was comfortable. There was plenty of room around the beds for a bag and shoes. The shower was good. Two friendly dogs that mostly ignored the visitors. Comfy bed in a homely hostel. The bed & bedroom was clean. You can help yourself to breakfast which I liked.